After the immense success of Batman Begins in 2005, Nolan & Bale & Caine immediately teamed up again for The Prestige, a film that is a modest step up from an already high bar. Batman Begins is based on the comic legend, The Prestige on a highly acclaimed fiction novel, both showcase Nolan’s incredible talent in story-telling, as well as his ability to take audiences willingly into the dark. Nolan wrote the screenplay for this film with his brother Jonathan, and you would be hard-pressed to decide where more credit is due, in the writing or in the directing, as both combine to weave one of the most compelling tales you will ever watch on screen. And that’s totally ignoring the spectacular acting, another element that simply makes this movie a right-now must-see. Two talented magicians battle for glory in London at the turn of the century, pushing each other to explore how dirty they are willing to get their hands. Alfred Bordon is a street-wise prodigy, but lacks the showmanship to be a star. Robert Angier can wow a crowd, but relies heavily on his man behind the curtain, the talented craftsman Cutter. When an accident occurs in a show on which they are both working, the rivalry becomes malicious, and when Bordon creates an illusion called the Transported Man that moves him instantly from one box to another, Angier becomes obsessed with stealing the trick. Both men lose sight of what it was they once loved about performing, focusing entirely on besting the other, no matter what the cost. The plot is much more complex than that summary gives it credit for, but you’ll just have to watch to find out how, if by some strange chance you’ve never seen this movie. I assume most have; it’s currently one of the top rated films in IMDb history and a genuine masterpiece. Nolan uses his patented chopped-up storytelling style, weaving together timelines until your head is spinning, but always with an eye toward our entertainment. That’s one of the major themes of the movie, that we’re missing the obvious, that we’re being distracted, that perhaps we don’t actually want to know the truth. Even after the film is over you’ll find yourself questioning what it is you think you saw, but count me as someone who loves a good challenge. The acting here is more than fine, it’s perfection, Bale & Jackman & Caine all delivering excellent performances. Their lady counterparts are strong as well, if not so important: Scarlett Johansson, Piper Parebo, Rebecca Hall. Even David Bowie and Andy Serkis pop up for a bit, their duo being perhaps the least explained, the most complicated, and the pair that still have me thinking. 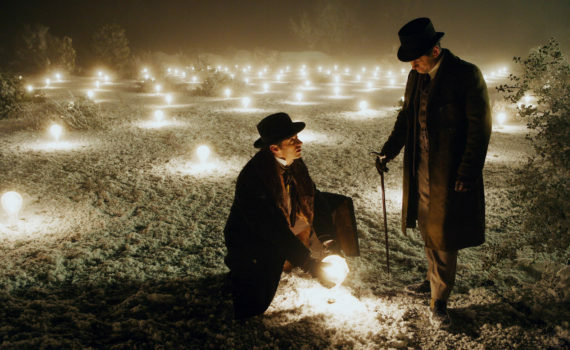 The Prestige is a spectacle on many levels, a film that can be enjoyed on the surface or picked apart infinitely, that’s up to you, which is all part of the magic.